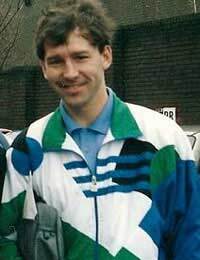 A classic midfield all-rounder Bryan Robson was brave to the point of occasional foolhardiness often sustaining injuries as a result of his never-say-die attitude that made him a successful captain for Manchester United and England. Had he not had so many spells out of the game, he would almost certainly have achieved over 100 England caps, but even so, to achieve 90 caps is impressive, and 26 goals makes him one of the highest scoring midfielders for England. Captain Marvel, as he was known to Manchester United fans, didn’t get a great start in the game, breaking his leg three times in one year when playing at West Bromwich Albion as a full-back, but showing characteristic drive and motivation to come back and be selected for England by then manager Ron Greenwood. He had completed a successful switch to central midfield and although his debut came during the closing stages of qualifying for the 1980 European Championship, Greenwood considered him too green to take to Italy. After that, though, Robson was a shoo-in for the team whenever he was fit. He was strong and tenacious, with a fabulous engine, and covered the pitch from front to back. When Glenn Hoddle was playing, Robson would play the holding midfielder role, or with Ray Wilkins he could play further forward to support the strikers. Either way, he would be helping out at the back when necessary, then surging into the gaps behind the forwards to score goals with either of his feet or his head. Just before the vital final qualifier for the 1982 World Cup finals, Robson was taken to Manchester United for a then record £1.5 million by Ron Atkinson, who had been his manager at West Brom. England won that last qualifier against Hungary and in Spain, Robson announced himself on the world stage by scoring the fastest goal in World Cup history, during England’s first match. The record, with Robson scoring on 27 seconds, stood until 2002, and Robson scored for a second time, this time with a towering header, as England beat France 3-1. After topping the first group, England unfortunately then couldn’t score any goals in the second group round and although undefeated, had to return home. There were a number of changes after that World Cup in Spain, Ron Greenwood stepping down in favour of Bobby Robson as manager, and the core of the team, Kevin Keegan and Trevor Brooking retiring. Bobby Robson soon declared Bryan Robson as the new England captain, but the new team didn’t come together quickly enough and could not qualify for the 1984 European Championship. At the 1986 Word Cup, a fall in the group match against Morocco aggravated a shoulder injury and caused him to miss the progression to the quarter-finals and the loss to Maradona’s two goals, one sublime, the other ridiculous. Hopes were high for the next major tournament, the 1988 European Championship, after England stormed their group, winning five and drawing one out of six matches. But the lynch-pin of the defence, Terry Butcher, broke his leg before the final tournament, and after a scrappy (and, frankly, typically English) defeat by the Republic of Ireland, eventual champions Holland tore open a raw English defence to finish off English chances. Marco van Basten scored a hat-trick in the 3-1 defeat, and Robson’s clever one-two with Lineker and chip over the keeper for the England goal was scant consolation. By now, Robson the manager was aware that he would need to look for a replacement for Robson the player, as he neared the end of a decade of apparently tireless England performances. But Robson was on his best form through the qualification campaign for Italia ’90, captaining England for the 50th time in a 5-0 win against Albania, and scoring both goals in a 2-1 win over Yugoslavia, the first, at 38 seconds into the match, being the fastest England goal at Wembley. Going into the group stages of the 1990 World Cup tournament Robson was in place for the 1-1 draw with the Republic of Ireland, but was substituted during the next match, against Holland, when Achilles tendon and toe injuries flared up again. The substitute, coming on for his sixth cap, was the man that Robson had identified as Robson’s long-term successor, David Platt, and it was Platt who became a tournament star as England went on to an undeserved semi-final defeat by West Germany. It looked like Robson’s England career was over, particularly as his namesake was moving on too, with Graham Taylor taking over the manager’s post, but Taylor did recall Robson as cover for Platt for three matches, taking his caps total to 90. Robson had been a pivotal figure for ten years and must have been disappointed that in the major tournaments, he had either been injured or the team had not fulfilled expectations. But he leaves memories of a tireless servant for club and country, the like of which is sorely missed in football’s modern era.